KENNEDY SPACE CENTER, FL--Launch of an Atlas 5 rocket carrying two NASA satellites to study the Van Allen radiation belts was delayed 24 hours early Friday because of last-minute questions about a C-band transponder needed by the Air Force Eastern Range to track the rocket during the climb to space. After reviewing telemetry, NASA and United Launch Alliance, builder of the Radiation Belt Storm Probe's Atlas 5 booster, decided to press ahead for another attempt Saturday at 4:07 a.m. EDT (GMT-4), the opening of a 20-minute launch window. But in a brief statement released Friday afternoon, NASA did not explain how the issue was resolved. 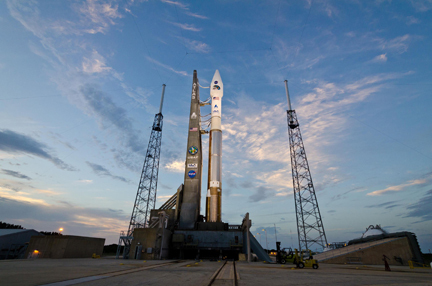 "The decision (to proceed) followed a series of meetings to evaluate 'out-of-family' readings in the signal of a C-band tracking device linking the Atlas 5 rocket and ground-based range equipment that caused a scrub early Friday morning," NASA said. "The C-band transponder is one of several systems used to track the vehicle after launch for range safety purposes." The forecast for Saturday calls for a 60 percent chance of acceptable weather, with scattered clouds at 3,000 and 22,000 feet, isolated coastal showers and winds gusting to 16 mph. The outlook for Sunday drops to 40 percent "go" due to high winds and cloud cover. The weather was not a problem Friday and the countdown proceeded smoothly until the final few minutes. "Toward the end of the countdown we did get a reading that the C-band tracking beacon on the launch vehicle, the frequency of that C-band tracking beacon, was drifting from the range systems that are picking that up," said launch director Tim Dunn. "Now that's a mandatory safety item so we can track the vehicle in flight. "With our very limited window, we did not have enough time to evaluate the cause and if we were OK. The reason that C-band beacon is so important is in flight, we really only have a few tracking sources. We can skin track with the radar, we can track the telemetry coming back from the launch vehicle, we have optical tracking and then we have this C-band beacon. If we were to lose one of these mandatories, we would be down into a situation where it might not be acceptable to pass through certain times of flight, such as staging events. The launch team, Dunn said, decided "to err on the side of conservatism. Tomorrow or the day after are fine days to launch." Replacing the transponder would have required rolling the rocket back to its processing building, likely delaying launch to early next week. But after studying telemetry, engineers concluded the rocket could be safely launched Saturday without any time-consuming repairs.